Even though some animals can go with extremely little sleep, all known species on the planet (including plants) need it. Sleep deprivation can not only make someone a slow thinker, it can cause illnesses and even death—not by coincidence, sleep deprivation was used as a torture tool in communist gulags. Among all pets, cats are known for being very sleepy. And indeed they are. All cats, including big ones, are sprinters by nature. They only chase their prey for short distances and rest often to gather strength for their next sprint. This is partly why cats need to sleep so much and so often. Kittens usually spend about 12 hours per day sleeping. Adult cats sleep between 7 and 12 hours per day, but this number can go up to 15 or more. Older cats sleep as much as adult cats as far as total number of hours, but their sleep is more fragmented. Cats may spend an additional 4 to 8 hours in a “drowsy” state. Technically speaking, this isn’t sleeping, but it can be described as such by pet owners. 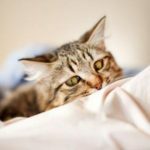 What can affect your cat’s sleeping time? So, 7 to 12 hours for adult cats: that’s quite a range, meaning some cats sleep almost twice as much as others. Why so? Because cats are different. The wide range has been observed in cats living in varying conditions, starting with farm cats who sleep very little and ending with laboratory cats who live under controlled lighting conditions. Time of year, abundance of prey and possibilities for activities all contribute to changes in the sleep-wake patterns of cats. Amount of light. Cats are extremely responsive to light. Their reproductive system is regulated by seasonal changes in the amount of daylight, and their sleeping patterns are affected by the amount of light, too. Basically: the more light, the less time spent sleeping; this includes both natural and artificial light. In a laboratory experiment when a light was kept on continuously for a group of test cats, the cats gave up several hours of sleep but spent those hours being drowsy. 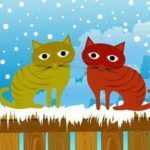 Thus, don’t be surprised when your cat gets more active as the spring approaches—while birdsongs contribute to this, the amount of light is the main cause. This also means that bad weather, such as a cloudy day, can make your cat sleepy. This isn’t surprising when we notice how it affects us in a similar way. Activity and stimulation. If you interact with your cat more, talking or playing with him, he will sleep less during the day. 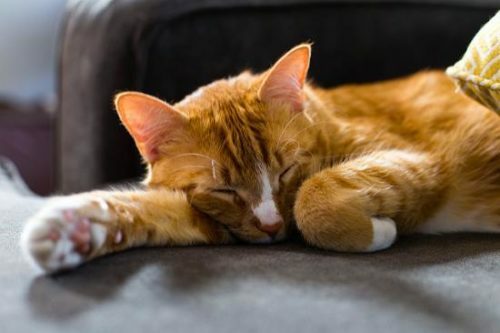 While interaction may not always reduce the total number of hours your cat spends sleeping (though it can), it is still good practice because, as result, most of your cat’s sleeping will be done at night. Note that both over-stimulation and lack of stimulation can make your cat an extreme sleeper. If your cat sleeps for more than 15 hours per day, it may be caused by stress due to either boredom or over-stimulation. Amount of food. Reducing the amount of food given to your cat not only reduces the total time spent sleeping, it also makes the sleep more fragmented. On the contrary, feeding your cat more than what is needed not only leads to obesity, it will also cause excessive sleepiness. This makes sense when we look at a cat’s natural food gathering sequence—in the wild, a cat is active before a meal (through hunting) and will take a nap soon after it. 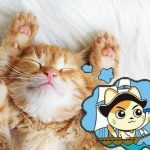 Thus, if food is available to your cat upon waking, what may happen is that your cat stays in a nearly continuous state of sleep with only short meal breaks here and there, which could lead to future health problems. Alarmingly, many indoor pets live like this. The first step to change this would be to feed your cat scheduled meals and provide some activity before each meal. Medical problems. Many medical conditions can affect your cat’s sleep, as does the medicine used to combat them. 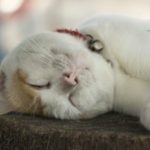 For example, cognitive dysfunction syndrome, which affects older cats, increases the total time spent sleeping and makes sleep more fragmented. Remember, the factors affecting your cat’s sleep aren’t simple or straightforward. It isn’t only about how much your cat sleeps, but the whole sleep-wake cycle over a 24-hour period or even several days and weeks. You can’t change one part without affecting another. In general, cats will claim their hours of sleep no matter what, and for us, it’s better for them to be active during the day so they can indulge in sleep at night.